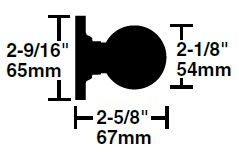 "Heavy Duty Performance for High Traffic Applications"
- Delivery: The Schlage Commercial D-Series Orbit Knobs are factory-ordered, please allow 3-5 working days' lead time. Schlage D-Series knobs are built to tough manufacturing standards that ensure a long life with smoth performance. With finishes to fit your building design, and a choice of styles, the D-Series is on eof the toughest knobs we make. We pay attention to these details so you can focus on creating a functional and aesthetically pleasing environment for your clients. In fact, every one of our D-Series locks meets ANSI Grade 1 standards for safety. - Exceeds 800,000-cycle ANSI Grade 1 requirements. - Exceeds ANSI A156.2, Series 4000 Grade 1 lock knob torque requirements. - Heavy-gauge, cold-rolled steel mechanisms are corrosion treated for normal atmosphere conditions. Function: The Schlage D-Series Knobs are available in Passage (D10S), Privacy (D40S), Keyed Entry (D53D), Classroom (D70D), Storeroom (D80D), and Single Dummy (D170) function. Finish: The Schlage D-Series Knobs come in Brass (605), Oil Rubbed Bronze (613), and Satin Chrome (626) finish. 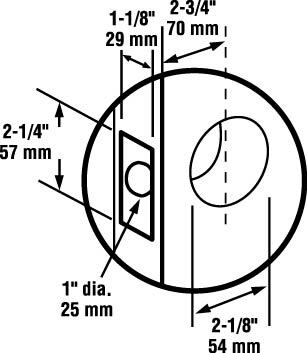 Knob Design: The Schlage D-Series Knobs come in Orbit (ORB) design. Cylinder Options: All Entrance (D53LD), Classroom (D70LD), and Storeroom (D80LD) functions are sold Less Cylinder; see "Companion Items" above for all Cylinder & Keying options. All Schlage D-Series Locks come standard with Square Corner 2-3/4" Backset Latch (Spring Latch 14-001; Deadlatch 14-019) and Square Corner Strike (10-025). 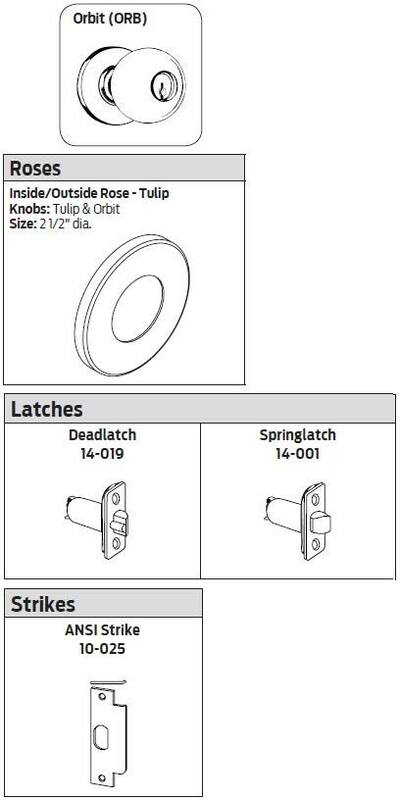 Backset: Standard 2-3/4" Backset (Spring Latch 14-001; Deadlatch 14-019). Special Order Information: For pricing on any function or finish of the Schlage Commerical D-Series Knobs not found on this page please contact Taylor Security direct via e-mail (sales@taylorsecurity.com) or call us toll-free at 1-800-676-7670. Strike: 1-1/4" x 4-7/8", ANSI, Square Corner, Box (10-025). Special Order Information: For pricing on any function or finish of the Schlage Commercial D-Series Knobs not found on this page please contact Taylor Security direct via e-mail (sales@taylorsecurity.com) or call us toll-free at 1-800-676-7670.